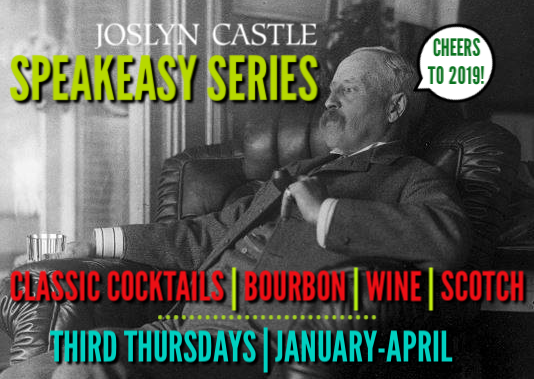 Raise a glass and join us for a Scotch tasting in the historic Joslyn Castle Music Room featuring local expert Kari Korenchen of PROOF Whiskey Bar! Carefully selected pairings curated by certified Cheesemonger Miranda McQuillan will be offered as compliments throughout the evening. The evening begins with a drink and tour of George Joslyn's rarely-seen mancave basement. After you explore the former epic space, we'll get settled in for an evening of sipping, noshing, and conversation, guided by our two experts. There will also be an opportunity to pick up a new set of rocks glasses, mixers, and other quality drinking accessories from our friend and event sponsor Boyd of The Simple Man.